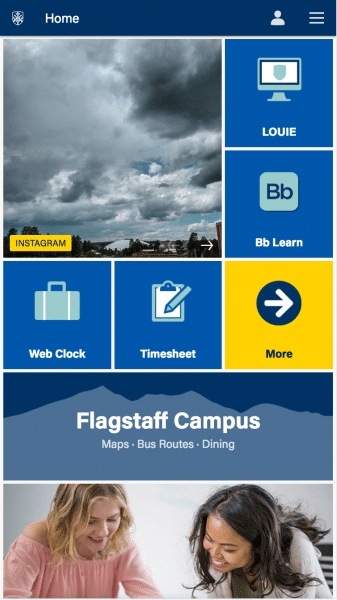 In accordance with NAU’s “Mobile First” strategy, the Experience Design Team has been tasked with deploying an upgraded NAU mobile app. The primary objective of the project is to improve on the existing app by providing a deeper, more interactive experience that will contain features that students, faculty, staff, parents, and alumni really want and need. The app is developed on the Modo mobile platform. It is currently available for iOS from the App store and for Android at Google Play. The image on the left shows the experience of the app as of July 2018. As you can see the home screen navigation is limited to just a few items that are critical to students and student workers. The home screen presents an opportunity to create a more robust navigation experience. To do this the XD team has proposed broad “buckets” of items that the user can quickly navigate to and find what they need. An example of a bucket would be “Move” which contains information about campus transit, city transit, parking availability, parking payments, and getting here and away. In addition to the Move bucket, we have proposed other buckets such as Live, Learn, Connect, and Work. The new enhancements to the mobile app are currently being developed with an initial launch scheduled for the beginning of the 2018-19 academic year. Continued expansion of the app will happen throughout the academic year.